Ever wanted to fake your own moonlanding? Interested in the terraforming of mars to create conditions suited to life? Wondered what it’d be like if other planets filled our views in the sky? You might like science fiction, and coincidentally may also dig the newest kid on the video software block, weighing in hefty in the mac corner, ladies and gentlemen, VDMX 2. Written with the video programming language Nato, VDMX2 is an impressive software video mixer and real-time effects processor from the vidvox.net stable. 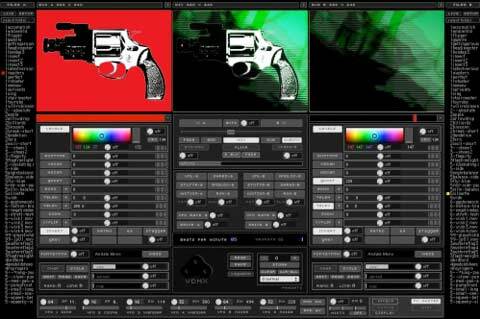 Vidvox tackle a range of experimental art and online projects, installations, and software, of which VDMX2 is their finest moment, hitting the mark well and solid. So how does a real-time software video mixer work? VDMX2 is broken up into 3 columns, each with a small video window. The left and right windows display selected movies of live camera input, and a range of real-time effects parameters underneath. The middle window contains your output screen – eg what’s being delivered to your video projector, and a range of mixing controls, playback controls and time based functions underneath. Video performance with VDMX2 can be as simple as loading up a bank of clips to channel A+B, selecting clips for previewing in the left and right monitors, then adjusting effects and colour or motion controls on either clip, then cutting or mixing between clips, adjusting as you go. Its well thought out interface allows this to be grasped quickly, while also offering much greater depth, complexity and flexibility as it becomes more familiar. As music visualisation software continues to flourish, VDMX2 brings to the table several features which distinguish it with unique capacities and flavour. Although it has several cool effects which are fun and easy to use, it’s strengths lie in it’s unique and well-thought out functions. Vidi-yo breakbeat automatically cuts up clips into 32 parts, and allows specified parts of the clip to be played in particular order as time progresses, bringing real-time visual breakbeat to your fingertips with ease. Alongside this, are several motion based controllers which manipulate clip playback in a variety of ways, and movie playback control by clicking and dragging on the top or bottom half of the middle screen. Dragging on the top half allows playback direction to be changed or the place on the timeline, while dragging on the bottom half allows to quickly adjust the playback rate of the clip. ‘BPM’ detection happens by tapping the return key while listening to music you are making video to, and allows automated control of a range of effects. These effects are also controllable by VDMX2’s video oscillators – which link the effects parameters to their randomly generating numbers and allowing software control of parameter changes. VDMX2 has excellent colour control, with each of red, green and blue levels easily adjustable, as well as saturation, a ‘font synth’ which cycles your fonts and texts through one of the channels, a recently added looping function, a vagabond mode which randomly cycles through parameters, the capacity to save overall settings as global presets, and easy recording to disk of mixes for reuse and further remixing. Enough? There’s more, but if you’re into video, hopefully you’re already checking this out. This mac only software needs a G3 or G4 computer to run it, and tested fine on a g3/333mhz machine with 384mb of ram. They recommend 512mb of ram though, and allocating 300mb as a ram disk for faster access and processing of clips. You will also need US$495.00. Intuitive and easy to make trouble with, VDMX2 offers a great depth for keen vid-fiends, and enjoys a very effective interface loaded with useful and flexible features. Has been developed directly for live performance and it’s thoughtful construction has paid off. Updates to the program, and new bonuses are also frequent. VDMX with it’s live processing of multiple video streams, can sometimes slow a computer and the resulting frame rate of clips outputting very quickly, particularly if several effects have been layered. It’s also a little slow in changing clips. What are your favourite VDMX features? The “Video Frequency Oscillators” are similar in theory to LFO’s in audio synthesis. They are number generators which can be driven by the master clock, and assigned to any parameter. One VFO is a realtime pixel analysis module, which generates controller data based on the content of the image – one can create extremely interesting data feedback loops. (image is analysed, the results are effecting the image, which in turn is analysed again etc). Another killer feature is the breakbeat video module… a 32×32 ‘time matrix’ which allows the user to cut up the video rhythmically and with complete control. And your next software project – metamov? Metamov is similar to vdmx except it features non-realtime rendering at high resolutions, and extra effects and controls. I’m very interested in this because while artists, vj’s and musicians have for a long time understood the ideas of ‘realtime’ and ‘generative’ — the graphic and motion design community (which is substantially larger) is just starting to desire these kinds of tools. What interests u in the emerging ‘VJ scene’? That VJ’s are being recognised in their own right as ‘artists’ and less and less as ‘lighting technicians’. The most interesting work is where so called ‘VJ’s’ are actually complete multimedia groups doing original sound, video and stage performance at the same time. Check screenshots, a thorough run through VDMX, sample movies and online projects. For those keen – this nato tutorial shows a glimpse at the possibilities of the NATO programming language that built VDMX. World’s biggest listing of video software for mac, pc and other formats.